The numbers on the right correspond to the numbers on the map. By clicking on them you will see the shoreline and the beautiful scenery at that spot. Our cabins are on the peninsula which is visible when you click on Spot 2. 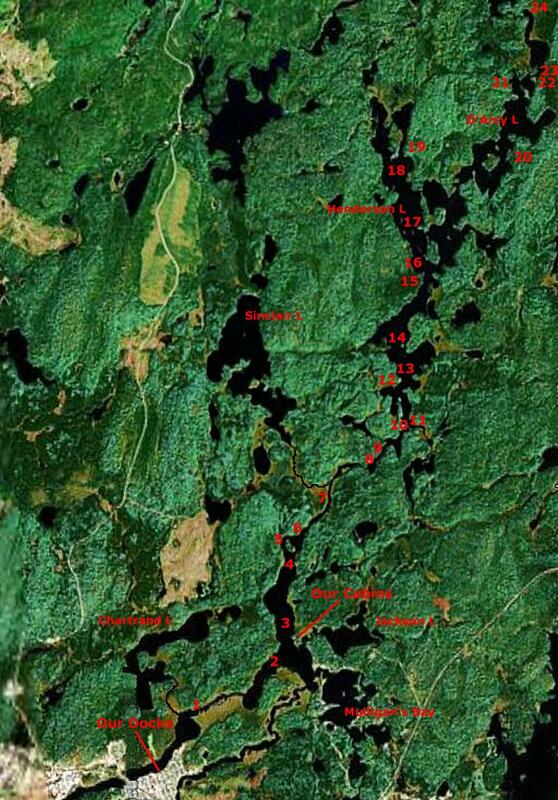 This chain of lakes that we fish and enjoy is part of the east boundary of the Chapleau Crown Game Preserve, a fur bearing animal preserve area. The Preserve covers some 7,000 square kilometres (2,700 sq mi). In the Preserve all animals are protected from hunting and trapping since its formation in 1925. When you boat along the chain of lakes you are likely to see many kinds of wildlife. Click here for more information about the Game Preserve.